Evolution Motorsports K24 Headers PORSCHE - Dezod Motorsports Inc - Home of the automotive performance enthusiast since 2002. 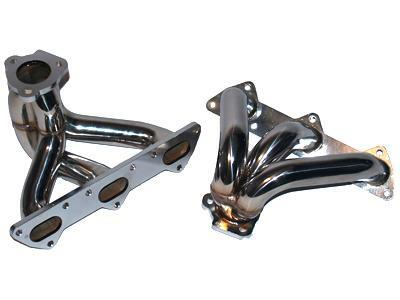 Evolution Motorsports K24 Sport stainless steel headers have been designed to increase HP and TQ on cars fitted with upgraded K24 and EVO GT640/700 turbochargers. The medium length and 41.5 mm primary tube diameter design is perfectly matched for the exhaust travel from the heads to the larger turbochargers for better boost response and power throughout the rev range. The smooth flow through the mandrel bends and pyramid merge collector offer superior flow characteristics as compared to the OEM headers. Power gains are increased by 17 HP and 20 Ft. TQ with no other modifications.